Joel Feder March 14, 2018 Comment Now! Mercedes-AMGs are known for big, brutish power that loves to go sideways. But what’s power without control? 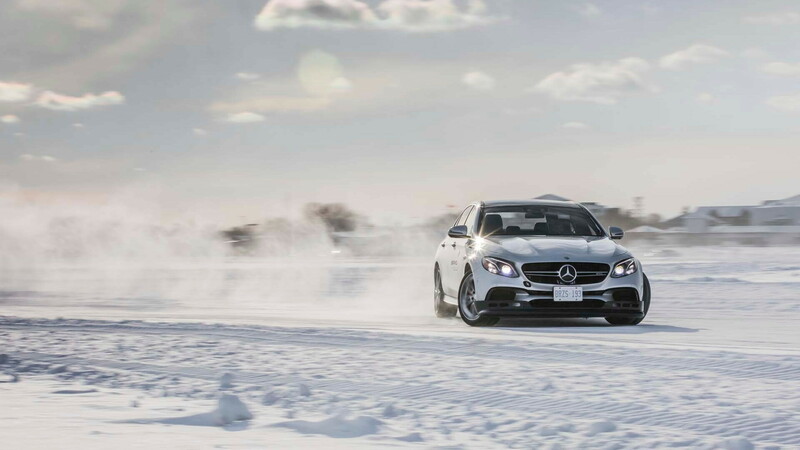 To highlight the difference in how various AMG powertrains maintain—or lose—control, Mercedes-AMG offers a winter driving academy dubbed the AMG Winter Sporting event. Chief instructor Danny Kok says the point of attending is to experience and learn sliding in an AMG—and to have fun. 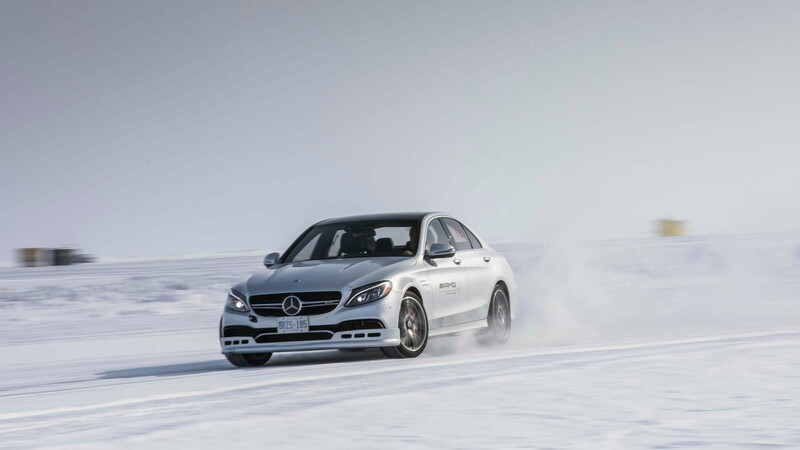 For a well-rounded experience, the 2018 Mercedes-AMG Winter Sporting event featured a healthy mix of vehicles that ranged from the twin-turbo V-8, rear-wheel drive C63 S sedan and all-wheel drive E63 S sedan, to the all-wheel drive CLA45 four-door coupe with a small turbocharged inline-4 under its hood. All three AMGs have an abundance of power that makes going sideways a breeze, but controlling that power is vastly different in each car. The rear-drive C63 S with its 503-horsepower, 4.0-liter twin-turbocharged V-8 is a brute, and lives in the old days of AMG: big power and only the rear wheels turning. On ice and snow it’s extremely easy kick out the rear end and induce oversteer, despite riding on Lappi winter tires with 2.2 mm studs. But it takes concentration and coordination between the throttle and steering to keep control of the slide. Too much throttle or too much twist on the steering wheel results in either a spin, understeer, or worse, a crash. A more executive approach is the all-wheel-drive E63 S sedan powered by a 4.0-liter twin-turbo V-8 huffing through twin-turbos. Its 603 hp is sent to all four wheels through a rear-wheel-bias all-wheel-drive system. Going sideways in the E63 S takes slightly more effort than with the rear-wheel-drive C63 S due to all four wheels clawing at the ice and snow, but its extra length, width, and heft all do it favors by increasing the mass to rotate. Head into a turn with enough speed, crank the wheel hard, and the rear end will happily still kick out. Once sliding around a corner sideways, it requires less effort to maintain control with all four wheels clawing for traction. The E63 wants to right my wrong with the front wheels clawing, and pulling the car through the turn. I disagree at the moment; the rear-bias for the all-wheel-drive system means I can keep the rear swinging for just a moment longer. The CLA45 is the most surprising and the most entertaining of the AMG trio on hand at the AMG winter driving academy. A polar opposite to the V-8-powered AMGs, the CLA45 is a pocket rocket with a 2.0-liter turbo-4 producing 375 horsepower to a front-wheel biased all-wheel-drive system. With less weight than the two larger AMGs, the small CLA45 is by far the most tossable of the trio, making it more fun to charge into a corner with far too much speed, flick sideways, punch the brakes to break traction, countersteer, and then goose the throttle to maintain the slide. Should the car head in the wrong direction, dial in more steering and mash the throttle to the floor while maniacally laughing, the front-wheel-drive-based system will figure it out eventually. 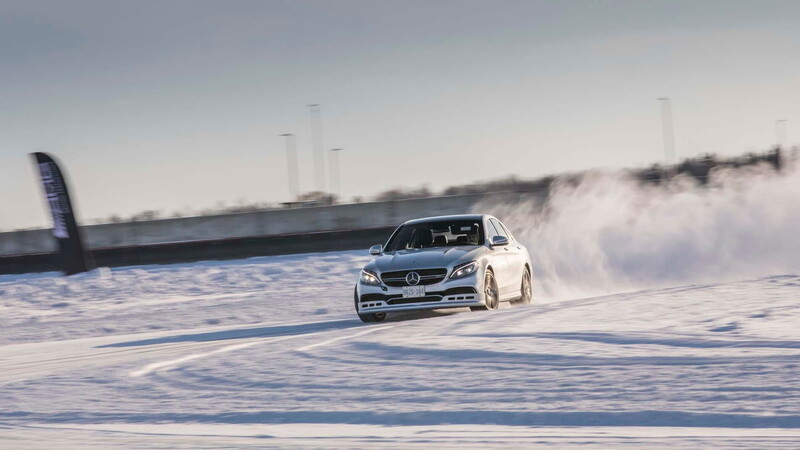 Mercedes-AMG’s had a winter driving school in Sweden for 10 years, but that’s a trip for North American consumers. 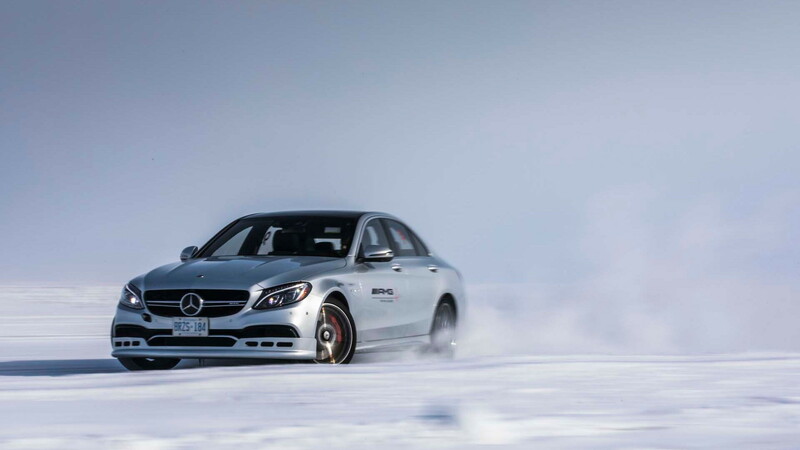 Mercedes-AMG started a second location of its Winter Sporting event on 400 acres of frozen Lake Winnipeg in Gimli, Manitoba, in Canada, which ran 5 weeks in 2018 with 188 attendees. In 2019, it will run 6 weeks with half of the projected 210 total attendees already signed up. Hint: Better book for 2019 right now. There are six tracks carved into the ice that total 5.69 miles. The circuits feature names like Spa, Monaco, Barcelona, and White Hell. 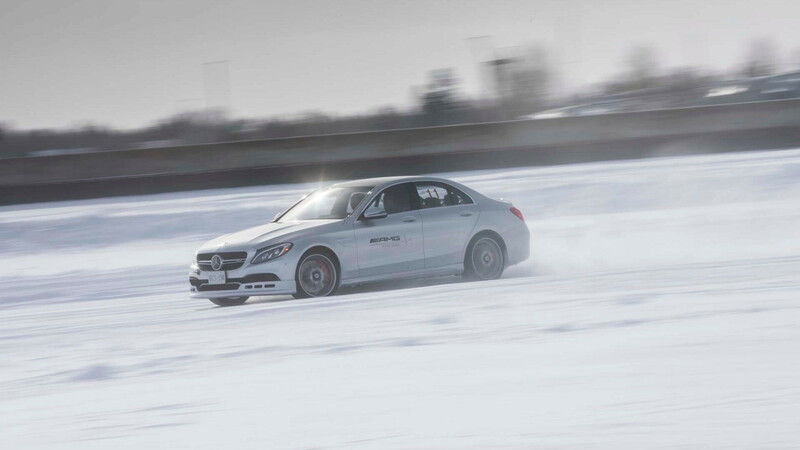 Mercedes-AMG is quick to point out that only half a foot of ice is needed to safely drive a car on a frozen lake. When the Winter Sporting event takes place the ice is more than five feet thick, which is double the thickness needed to safety land a commercial airplane. Three different schools are offered that range from a $2,334 1.5-day performance course to a $4,360 2.5-day pro course. An advanced course splits the difference at $3,502. The differences among the courses is amount of time behind the wheel and days on site (1.5 vs. 2.5 days, and single person per car vs. two people per car). The instructors are the same people you’ll find at the AMG Driving Academy performance track days—plus winter coats. All AMGs have abundant power, and the cars on hand at the Winter Sporting event are no exception. Going sideways in each isn’t hard, but controlling the slide is where each starts to take its own path. Mercedes-AMG’s Winter Sporting event highlights the difference in the brand’s wide breadth of performance offerings, and it’s just plain fun to slide sideways on ice in the snow. Mercedes-Benz provided travel and lodging to Internet Brands Automotive bring you this firsthand report.